Have you heard of Seasonal Affective Disorder, or SAD? SAD is a seasonal form of depression that causes people to feel moody, depressed, or a lack of motivation during certain times of the year — most often during fall and/or winter. Now, I’m no psychiatrist, but I’m sure I don’t have actual, clinical SAD. Maybe you don’t, either. (But I’m equally sure that many people do!) Regardless, there is something about the cold, dark months of winter that can make life a little less fun. During the winter we spend less time outdoors, we get less exposure to sunlight, and we have to give up some of our most enjoyed outdoor activities such as swimming, sports, picnics, camping, or what-have-you. There are less chores to do outside and less things to do in general. After January first, it’s a long stretch to Spring and there’s a lot less activity to occupy our minds. I do start to feel a little “blah” this time of year. My sleep schedule suffers due to the lack of sunshine and I get impatient for spring. Basically, I get cabin fever. Get me outta the cold and into spring, please and thank you! Spring is coming soon and I look forward to it, but I want to enjoy this season, too. This time of year I think it’s important to remember that each season serves a purpose and each season offers something different that no other seasons provide. Rather than getting stuck in the winter blues and reverting to the sleep schedule of a teenager, I want to embrace what winter has to offer and be joyful even in the cold. To do that, I’m adjusting my mindset from “I wish it were spring” to instead enjoying what January and February can give me! I don’t know about you, but I don’t get much reading done in summertime. For that matter, I don’t get much “for fun” reading done these days at all! Thankfully winter offers a time to slow down a little and pick up a good book (and maybe even finish it). Right now, I’m re-reading the Little House books. Those are classics that you just can’t outgrow. I think I’ll also pick up The Witch of Blackbird Pond — my all time favorite book ever — before spring dawns. Following along with the “more laid back free time” theme, winter is a great time to learn a craft! Doing so will occupy your mind and your hands to keep you busy while also teaching you a skill. I’m currently working on learning to knit using YouTube videos and an “I Taught Myself to Knit” kit. There are many different crafts to learn: sewing, crochet, knitting, embroidery, spinning, wood crafting — you name it! If it interests you, now is a perfect time to start learning how to do it. Go out to the barn at night. I know, I know — I’m telling you to get over the cold and dark months by going out in the coldest and darkest part of the day. But promise me you’ll do it at least once, because I promise YOU that it is so worth it! Because of my job schedule, most nights in the winter it’s after dark before I do evening barn chores. Sometimes I begrudge it, I’ll admit, but it really is such a peaceful time at the barn. The air in the winter is so much less humid that it makes for some absolutely beautiful stars — everything just looks crisper and clearer. It also allows sound to travel further as well. I don’t love that part so much when it comes to planes and traffic, but on the flip side I can also hear owls hooting and train whistles blowing much further away. And because it’s nighttime and winter, it’s much quieter than a summer night ever dreamed of being. The frost sparkles on the grass…the animals are settled in…it’s just a wonderful time to be in a barn. I believe in seasonal eating, and I also believe that winter is a time for comforting foods. Soups, stews, and root vegetables are staples for a soothing winter meal that will warm you up on even the coldest nights. These types of meals will brighten a winter’s day much more than say, a cold salad. Other foods that are guaranteed to make winter a little more cheery are baked goods. Breads are especially welcoming, and they also require a little bit of practice to get just right. Winter is an excellent time to get some practice in for your baking skills. A somewhat tricky task will be easy for you by the time the busier months roll around, which means you’ll be able to crank a loaf out quicker when you need to save time. Bonus: Bread needs a warm place to rise and a warm oven to bake, and that warm oven will help warm the house, too. Double duty! If you can’t beat ’em…fo-get about ’em! And by that I mean — dream of spring! The time to start planning your garden is now, if for no other reason than to remind yourself that you have something to look forward to on the other side of the spring equinox. Not to mention that many seeds need to be started indoors 6-8 weeks before the last frost date. That means I’ll be starting seeds in February here in Tennessee! Isn’t that fantastic? It will be a little piece of spring in the coldest part of the year! And my seeds have been arriving, too, which is also an exciting treat (almost like a second Christmas!). If you’re not sure where to start when it comes to garden planning, I have a blog post just for you that’s all about it! Take winter challenges in stride. Nothing makes winter more miserable than not being prepared for the weather. Been there…done that. It’s so much easier to be a good sport when you have appropriate clothes and supplies to cope with the nasty weather winter can throw at us. Our winter has been mild so far this year, but even so I made sure I was ready for whatever winter weather mother nature could throw at me. (Well, almost. I can’t claim to be ready for a blizzard, but the odds of a true blizzard in Tennessee are pretty slim.) Being appropriately prepared for winter makes it much, much easier to get through. I’d rather have 10x the winter supplies I need than to not have enough. Don’t neglect the importance of feeding your body good foods, taking healthy supplements like probiotics, uplifting yourself with aromatherapy, and just generally taking good care of your body. I stopped taking my supplements for about a month just by getting out of habit, and after I started taking them my energy improved by leaps and bounds. Don’t forget yourself! I also don’t feel that I should end this post without saying this: I am not a doctor or a therapist. This post is not meant to diagnose, treat, or prevent any medical conditions, including but not limited to SAD. If you feel that you may truly have clinical depression in the form of SAD (or any form for that matter), please reach out to a professional for help! Whatever winter looks like in your neck of the woods, I hope it’s treating you well! I sure needed this one today. Winter is always a tough one for me, especially since I am still working full-time in addition to trying to manage my homestead and prepare for our summer business. I think I really just need a good rest to recharge and take care of myself. Thanks for the reminder. I totally understand. 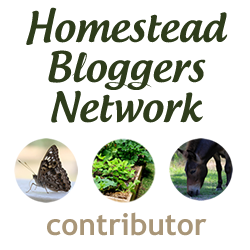 I would so love to be able to do nothing but homestead for a living! Maybe someday, right?